Gallery items have been sold. Click here for current items for sale. 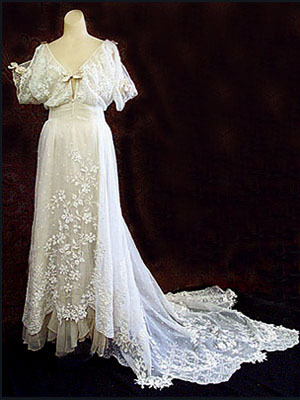 Hand-embroidered sheer cotton wedding gown from the Commodore Perry estate, c.1908. Oral provenance plus small Perry personal name tag inside. 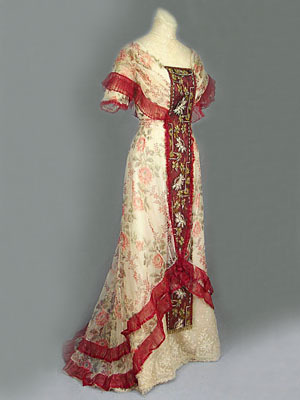 Callot Soeurs dinner dress of hand-embroidered silk charmeuse, c.1905. 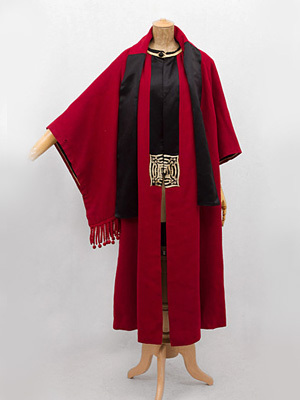 Wool coat attributed to Poiret, c.1910-1914. Liberty & Co. velvet burnous, c.1900. Label: "Liberty & Co/ London & Paris." 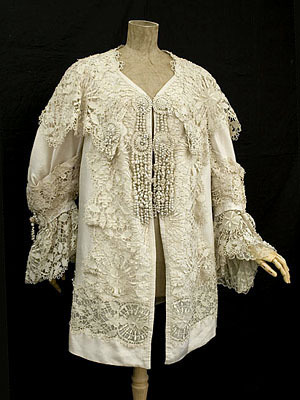 Couture quality silk coat trimmed with handmade Cluny lace, c.1900. 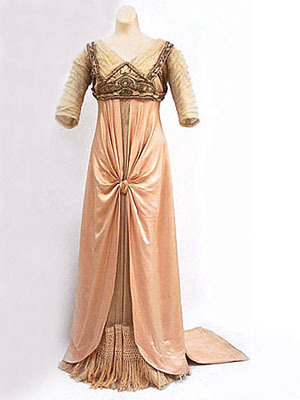 LaFerrière satin/tulle dinner gown with metallic embroidery, c.1912. 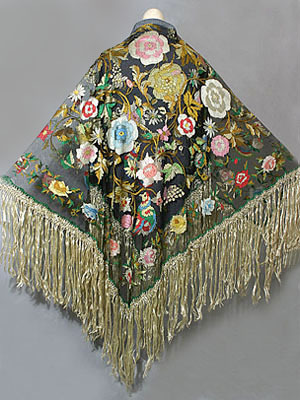 Label: "LaFerrière, Paris" is woven into the petersham. 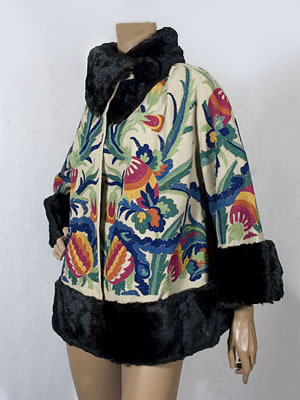 Russian-style cut velvet evening coat with beaded passementerie panels and sable trim, c.1910. 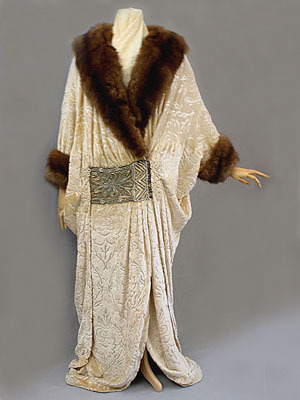 Cut velvet/silk chiffon evening wrap in the style of Erté, c.1915. Provenance: from the estate of actress Irene Worth. Handmade Irish crochet lace gown, c.1912. Label: "Miss Pilcher/307 Fifth Ave., NY." 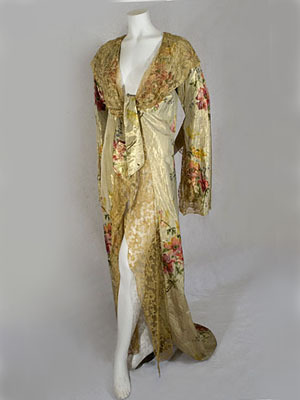 Floral gold lamé peignoir, early 20th century. 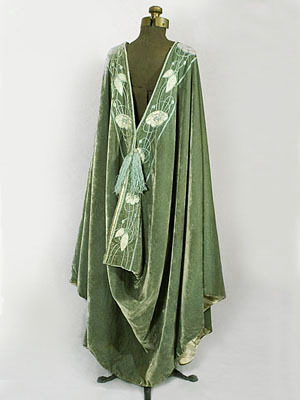 Hand-embroidered silk crepe wrap with hand-knotted silk fringe, c.1905. Chinese made for the Western market with the original tag. 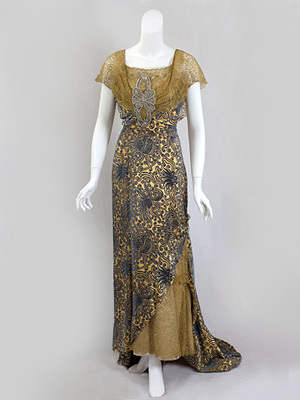 B. Altman beaded gold lamé evening dress, c.1915. 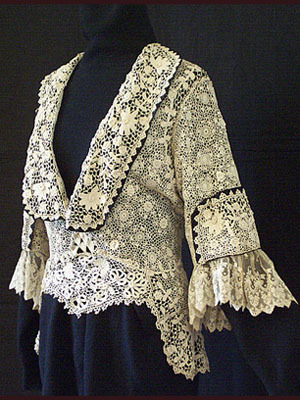 Handmade Irish crochet lace jacket with satin trim, c.1910. 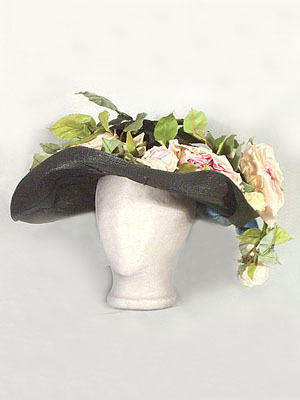 Marie Rebouch wide-brim straw hat with original decoration, c.1908. Label: "Marie Rebouch/40.Chaussée d'Antin/Paris." Floral tulle dress with beaded/embroidered panels, c.1905. 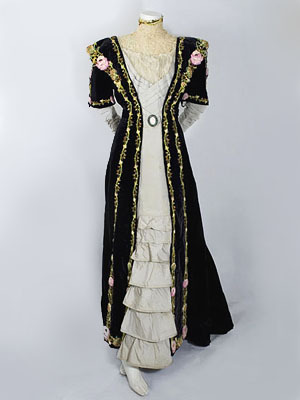 Appliquéd velvet reception gown, c.1905. Provenance: from descendants of Revolutionary War veteran, Captain Rufus Lincoln (1751-1838). 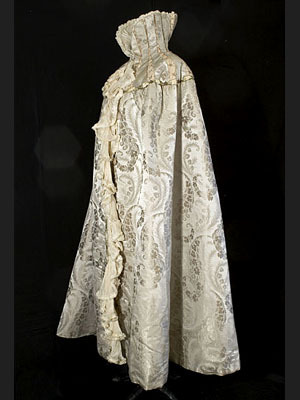 Silk brocade evening cape attributed to Worth, c.1900. 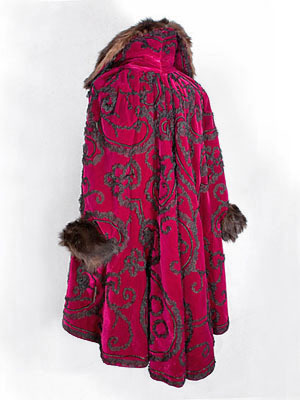 Magenta velvet coat trimmed with scrolling vines of ruched black chiffon, c.1900. Fur collar and cuffs. 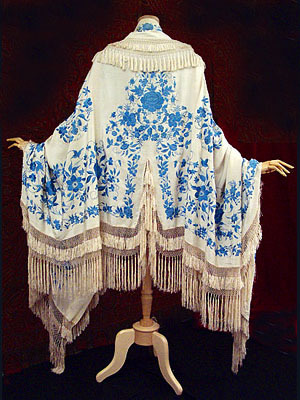 Spanish hand-embroidered net shawl, c.1910. 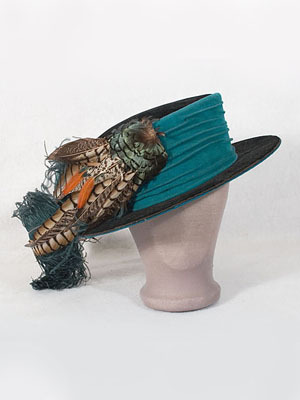 French velvet hat with feather trim, c.1900-1910. The label in the crown reads "George Allen, Inc./3 rue Bleue/Paris/1214 Chestnut Street/Philadelphia." 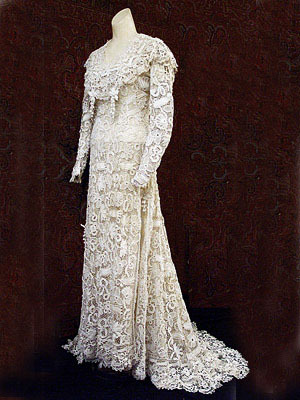 Irish crochet lace wedding dress, c.1912. 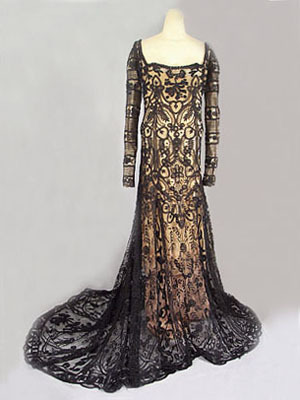 Devoré velvet evening dress trimmed with metallic lace, c.1910. 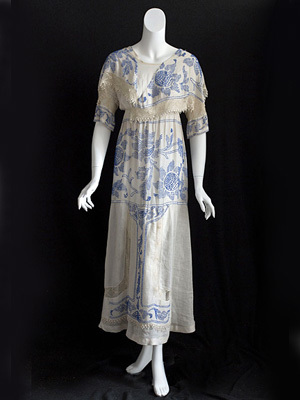 Sheer cotton tea dress trimmed with blue beads and Irish crochet, c.1914. 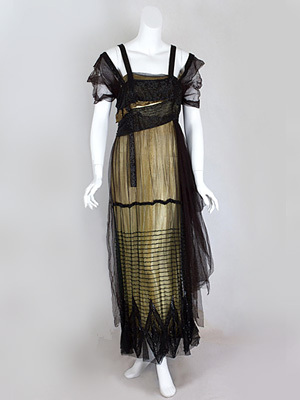 Hand-embroidered tulle lace gown, c.1912. 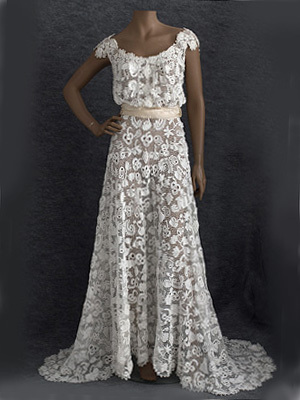 Hand-appliquéd lace inserts and back train. 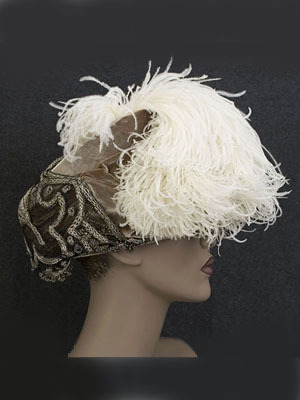 Velvet toque embellished with beads and a white ostrich plume, c.1900. The label reads "Geo. Allen Incorporated/1214 Chestnut Street/ Philadelphia." 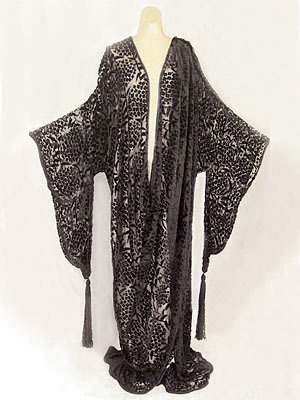 Soutache embroidered wool jacket trimmed with wide borders of silky black fur, c.1912-1918. 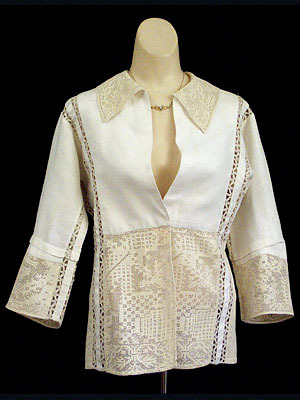 Callot Soeurs linen jacket with inserts of handmade filet lace, c.1910. 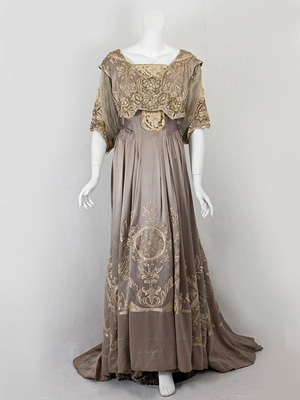 Label: "Callot Soeurs/Marque & Modèle/Déposés, Paris."